Bandit Lites is pleased to announce it is lighting Grammy Award-winning superstar Barry Manilow’s triumphant return to the world’s most famous street. After more than two decades, Manilow brings his colossal collection of hits to the St. James Theatre on Broadway. Opening night for Manilow on Broadway was Tuesday, January 29, 2013 and the show will run until March 2. 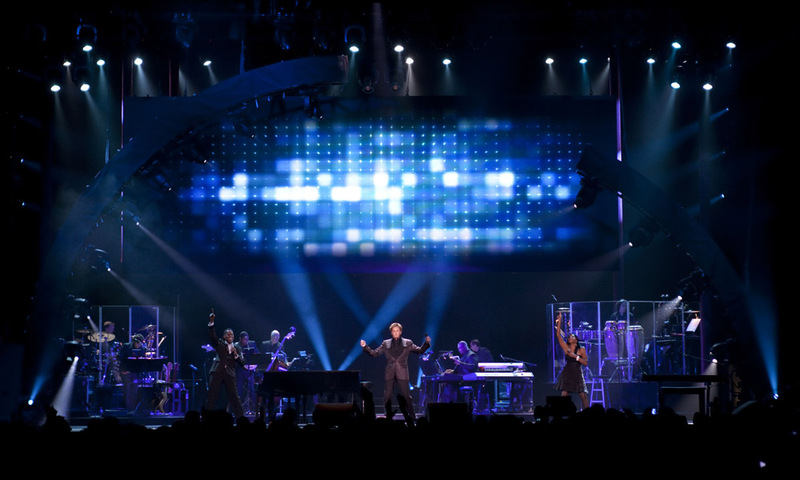 Lighting designer Seth Jackson worked diligently with Manilow to create an elegant and polished environment for the intimacy of a Broadway house. While some lighting designers could be daunted by the compact environment, Jackson adapted his design to fit the traditional venue with legs, borders and proscenium. That finer brush yielded what Jackson refers to as stylized one-man show, rather than a concert. The trusses are covered, and everything is masked. A video screen sits against black and all of the content has masks around it, giving the appearance the imagery is floating in the air. With the exception of front of house positions with Source 4s and scrollers, the rig is completely automated and made up of a combination of Martin MAC Viper Profiles™, MAC Auras™ and other automated fixtures. Jackson attributes his success to the show to the team he had surrounding him, including his associate designers Brent Sandrock and Nathan W. Scheuer. After a twenty year hiatus from Broadway, it was apparent that Manilow’s return held many expectations. After the incredible opening night, Jackson and his team were pleased to hear how rather than a “flash and trash rock show”, people found themselves commenting on the accurate and appropriate look of the show for a Broadway house, a compliment Jackson (who is from a theatre background himself) says he takes with a lot of pride. Boasting more than 80 million records worldwide, Manilow is known for his pop/rock hits “Could It Be Magic”, “Mandy”, “Can’t Smile Without You”, and “Copacabana (At the Copa)”. Five of his albums have been on the best-selling charts simultaneously, and his last Broadway show in 1977 earned him a Special Tony Award.